The painting “Twilight. 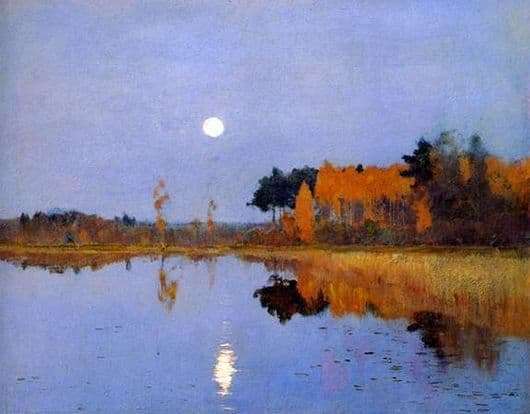 The Moon “is a picture of that period in the works of Isaac Levitan, when his canvases were entirely dependent on the mood and emotions that reign in the author’s soul. In the “Mood Landscape” all the last years of the artist’s life were dominated by melancholic and gloomy tones, which were a reflection of all the sorrows and disappointments of a lonely soul. Autumn evening. Most of the landscape is occupied by a pale blue sky with gray clouds, which seems even brighter in reflecting the calm, motionless surface of the river. The moon, the mistress of the night, has already appeared in the bright sky, not waiting for its nightly companions of stars. Even its reflection in the river is vague and unsteady, as if it doubts: “is it too early?” And the middle of the picture is horizontally filled with the main attributes of the autumn landscape – yellowed and darkened trees. A dim sun, not yet hidden behind the horizon, illuminates these golden, red and dark green crowns, giving the picture a share of bright joy. Everything in the picture is motionless, only slight ripples are visible on the river, in which the forest is reflected differently compared to the moon. It merges into one thick palette of yellow and orange colors and quietly awaits the coming night. Only two completely yellowed trees stand alone, separated from the dense grove: one almost near the coast, and the other closer to the forest in the distance. What mood does the picture cause? It is difficult to decide without considering it in detail. It cannot be said that autumn melancholy completely fills this canvas, but there is something in it that causes a slight heaviness in the soul. And it’s not in the gloomy sky, or the fading sun, or trees losing foliage, but in some special mood, which is transmitted from the picture. Thus, without resorting to exaggerating the sadness of the autumn landscape, Levitan achieved that the mood that arose at this time of year at least once in each one was fully reproduced by this picture.